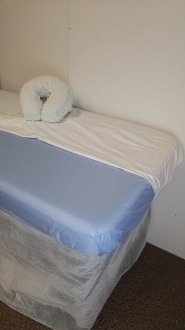 Massage table protective sheet. A medical grade, impervious polyester fabric which is engineered to repel and resist absorption of fluids creating an impenetrable barrier. Easily wipe fluids off and sanitize, or machine wash and dry. The Sani-sheet fits most standard tables ranging from 28" to 33" wide, 70" to 84" long, and 3" to 7" in cushion depth. The ultimate in protection of vinyl cushions.